• Chip repairs – Sometimes, a hail storm doesn’t leave behind any noticable damage. Sometimes the damage is relatively minor. Thankfully, a few windshield chips can be remedied pretty easily, but only if you get them fixed quickly. Letting any windshield chip sit for too long, regardless of the cause of the damage, could potentially allow it to grow in size. This means the repair costs for these chips will increase as well. 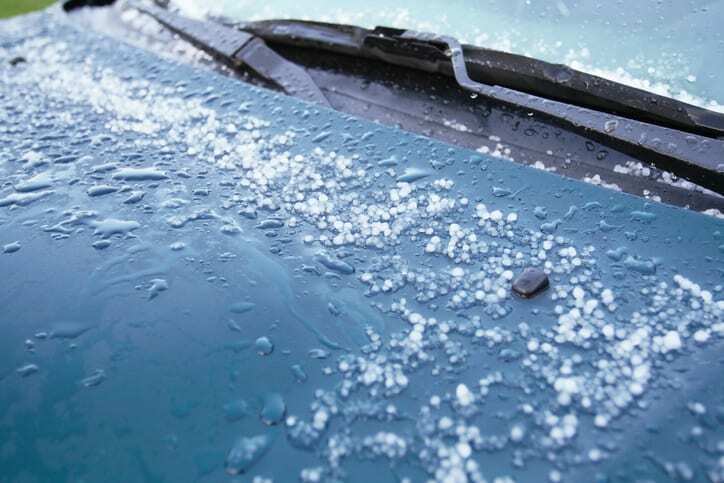 • Crack repairs – Larger hail stones or longer hail storms damage can result in major cracks for your windshield. Seeing that a piece of hail can range from the size of a quarter to that of a softball, the severity of cracks can range, too. Smaller cracks may be able to be repaired, but others can cause you to replace your entire windshield. • Windshield replacement – Whenever springtime hail storms blow through, they often cause vehicle owners to call us for windshield repairs or windshield replacement. Depending on the impact site and the size of the crack, your windshield might need to be replaced. However, it’s best to leave that call to a professional auto glass company. We’ll be able to examine your auto glass and give you the best solution for your particular problem, along with an accurate estimate for auto glass repair costs. Has a hail storm caused windshield damage to your vehicle? Call A-1 Glass Masters today for help. We’re the team to call for windshield repair in Savannah, GA, and Statesboro and Claxton, GA. Let our specialists help you with all your auto glass needs.